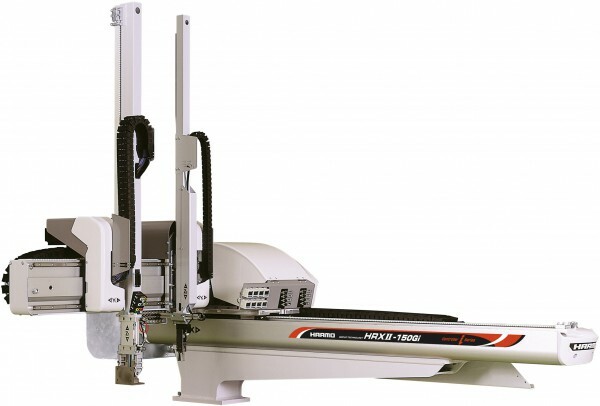 ・The robot uses the wide type cable tracks for all axes. tubes for extra valves and special applications. ・8 vacuums and 8 grips available for most applications. ・These wide frames are more rigid; 40% more in 150GW model. the traverse frame according to your factory’s layout. ・Standard grease catcher on traverse and kick linear guides. ・Unified layouts for cabling and tubing of the attachment. Colored caps make it easier to change attachments. ・EOAT attachments with various mounting hole pitches to accommodate every type. 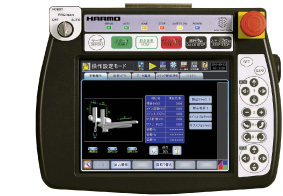 ・Communication with HARMO F series peripheral equipment. ・The robot controller has the operation menu for the peripheral equipment. ・Alphabets and numbers are usable on the mold memories, points and names. ・ The new screen structure simplified the controller operations including teaching. ・Smart programming cuts down the mold data creating time in a half so that programming is no longer stressful. ・The controller backs up 1000 mold memories into a general USB memory stick. The controller can hold up to 2000 mold memories with an USB memory stick. ・Languages: 3 languages are available to directly select on the menu. *Standard Languages: Japanese, English, and Chinese. The controller can hold up to 5 different language settings. Copyright HARMO Co.,Ltd. All Rights Reserved.